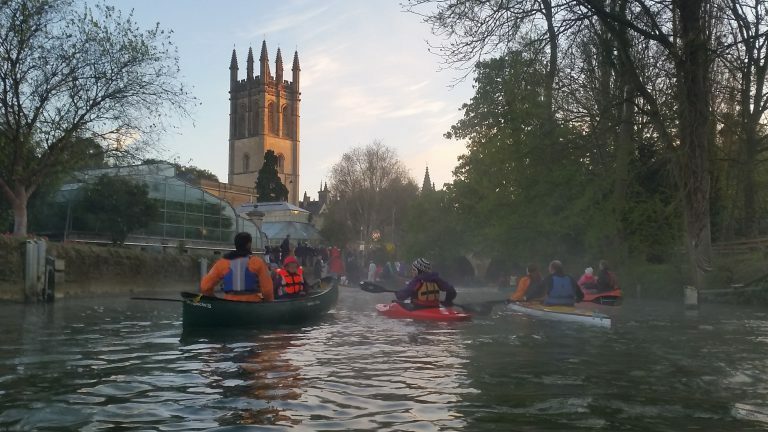 An eclectic collection of boats of all classes and schools coalesced on the Thames and the River Cherwell to join in a convoy towards Magdalen Bridge and the tower for the May Day celebrations. Kayaks were few in number so it was nice that we were there to add to the foray. 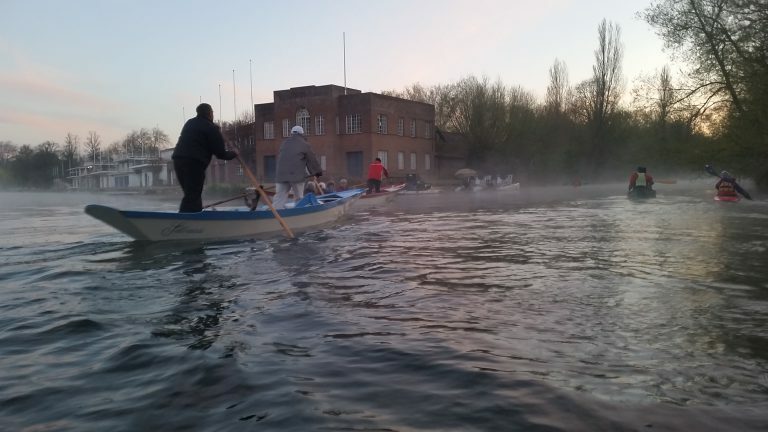 There were many open boats from local clubs, paddle boarders, punts of course and various rowing boats joining in a colourful flotilla, which steadily grew in numbers as we drifted down the misty Thames under a salmon tinted sky at dawn. Some fancy dress with some open boaters decorated with face paint added colour as people immersed into the occasion. 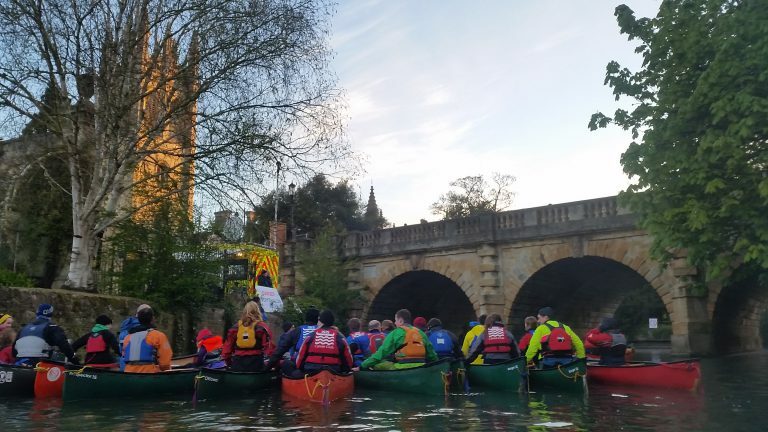 The flotilla glided up to the bridge as we all gathered below the Magdalen tower and as the clock reached 06:00am the Magdalen College Choir performed as hymns sounded out from the tower, a tradition said to date back 500 years. Mercifully there were no jumpers from the bridge this time thanks to the watchful eyes of authorities planted around the area and so after the short service including prayers and the haunting vocals of the choir was delivered from the tower the bells of the city rang out and a round of applause and appreciation from the crowd and the boaters filled the air. 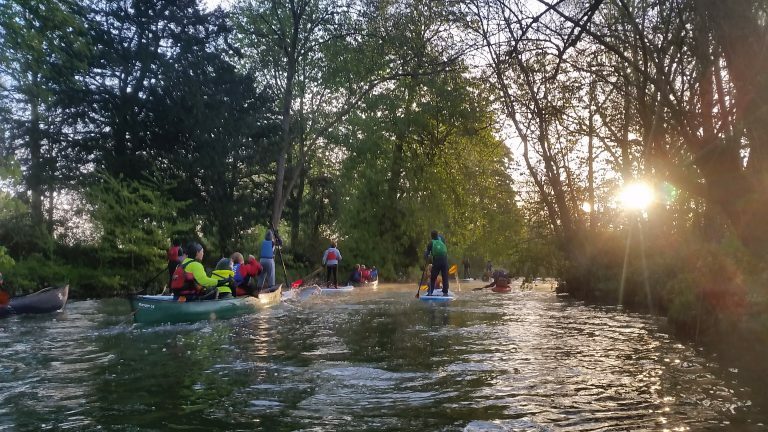 After the service the convoy of boats slowly continued under the bridge and along the Cherwell, paddling into the bright early morning rising sun. It was a lovely experience to join in this event and a really nice atmosphere.